Principal Cast : Gene Evans, Andre Morell, John Turner, Leigh Madison, Jack MacGowran, Maurice Kaufmann, Henri Vidon, Leonard Sachs. 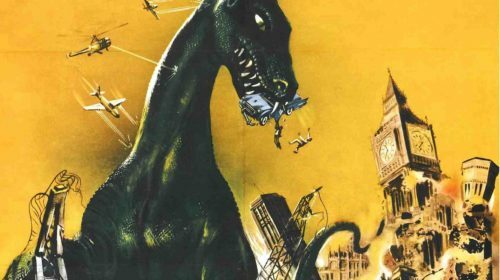 Synopsis: Marine atomic tests cause changes in the ocean’s ecosystem resulting in dangerous blobs of radiation and the resurrection of a dormant dinosaur that threatens London. An early exponent of the giant-monster movie genre, of which Godzilla and its ilk remain prime examples of, 1959’s The Giant Behemoth is a redundantly titled exercise in atmospheric build up and low-budget payoff, the kind that makes you giggle with how silly it looks (and must have looked back in the 1950’s). With a game cast and persistently extravagant visual effects (when they finally arrive half way through the film), as well as surprisingly precise and claustrophobic direction by Eugene Lourie (who also directed 1953’s The Beast From 20,000 Fathoms, so really pushing his wheelhouse here! ), The Giant Behemoth hits all the markers for a well executed example of this genre, lifts the premise directly from his previous film and rock-solid delivers the thrills and excitement a production of this era and budget can muster. Remarkably, it’s a legitimately entertaining film, despite gaping flaws and incredible leaps in logic. 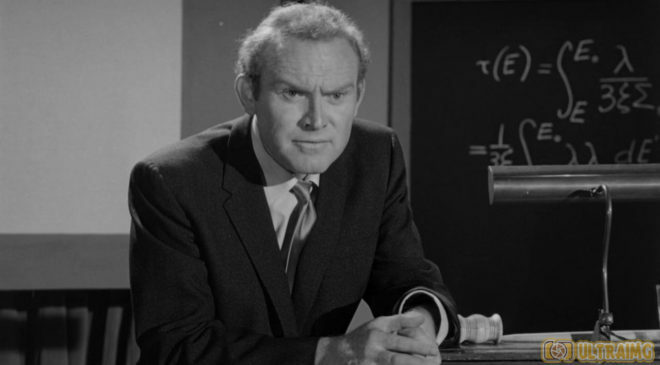 After scientist Steve Kearns (Gene Evans) delivers an impassioned speech to a British science body regarding nuclear fallout damaging ecostsyems and affecting animal life on this planet, he is supported by fellow intellectual Professor Bickford (Andre Morell). Meanwhile, off the Cornish coast, a fisherman is killed by a mysterious radioactive force he calls “behemoth” before passing, leading both Kearns and Bickford to suspect that some enormous creature could very well be lurking out deep in the ocean. 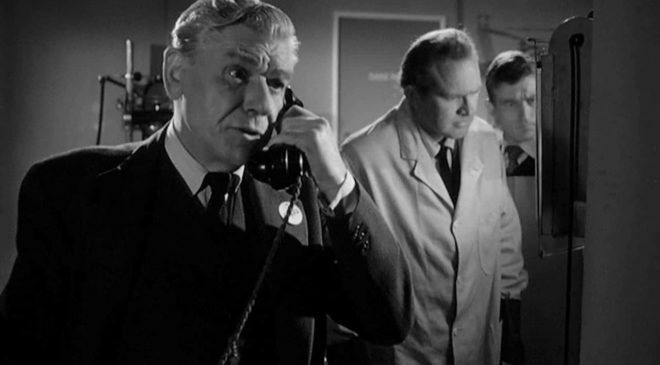 As their investigation continues, it is revealed that an enormous prehistoric beast, living deep beneath the ocean surface, has indeed been affected by the proliferation of nuclear weapons testing, and is, as palaeontologist Dr Sampson (Jack MacGowran) explains, looking for fresh water in which to die, which means the Thames estuary is a prime spot for the creature to emerge. As the army plans to blow the creature up and scatter its radioactive carcass all across London, Kearns and Bickford must devise a plan that not only kills the creature but keeps it in one piece. In some markets, The Giant Behemoth was known as Behemoth The Sea Monster, which makes far more sense given a behemoth is already giant, and labelling it as such is an effort in redundancy, a bit like saying “a tiny midget”. 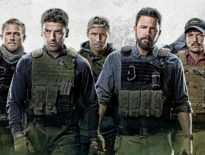 Regardless of this grammatical inconsequentiality, the film itself is, despite its low-budget roots and generic storytelling, actually a rather effective example of the subgenre. Like Godzilla before, and copying almost exactly Lourie’s own 20,000 Fathoms, this giant monster movie kicks off with a mystery, involves both science and military factions working out how to deal with whatever threat is posed, and concludes with a protracted attack by the threat – in this case, an enormous paleosaurus – on a large urban population center, here represented by the wonderful city of London. The film can be divided up into two distinct acts, the first being the far more ominous “buildup” to the reveal, in which Evans and Morell’s characters do a lot of the grunt work explaining the threat, expositing its existence, and working out what – if anything – can destroy it. The second act involves the beast’s arrival in London, its attacks on people and the casual deaths of various members of British society, and the inevitable action-packed climax, most of which occurs using a splendidly kitschy mix of stop-motion and miniature photography. The script is credited to director Lourie and one Daniel Hyatt, although Hyatt was a pseudonym for blacklisted screenwriter Daniel James: and it’s a fairly pedestrian script at that. The characters aren’t particularly well developed, their personalities equally so and designed to serve the action and story rather than any emotional construction, and the film’s core arc is derived from searching for, and then trying to stop, the enormous creature of the title. The leading performances by stiff-upper-lipped Gene Evans and Andre Morell, as well as the ensemble supporting cast, veers between far better than the film deserves and far worse than one expects even in a film like this, so take it all with a grain of low-budget salt and consider yourself warned. 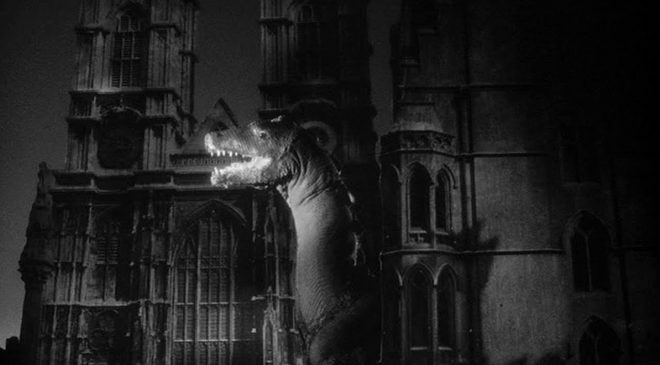 Most of the film was shot in England, either on soundstages or on location, with the creature effects shot using stop-motion by Hollywood animation legend Willis O’Brien (The Lost World, King Kong) and composited over live-action photography. 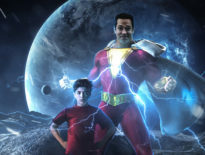 The blend between live action and the effects work is starkly dated by today’s standards and the seams show even moreso on a high definition-capable screen, but the glorious energy behind the camera and enthusiasm to showcase as much of the monster’s carnage as possible in the film’s closing act is tangible and exciting. Okay, it looks like a large budget episode of Doctor Who, wobbly sets and egg-carton creatures included, but it’s all so joyfully sincere you can’t help but grin at the thing. Whereas most monster movies of modern times tend to lean heavily into the “reveal” moment of such stories, and the consequential aftermath, The Giant Behemoth works best before we ever see the creature. 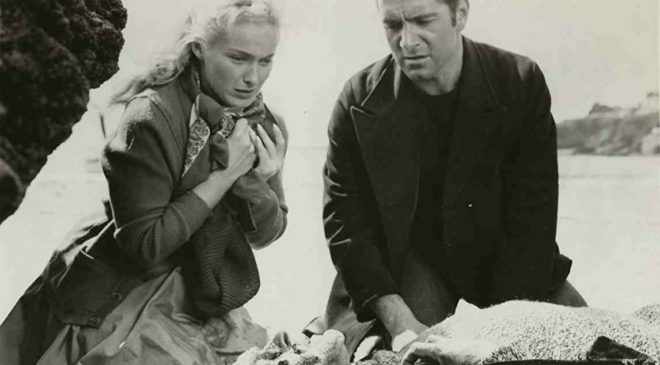 The gradual buildup to its reveal, protracted through lengthy exposition and discussion about the potential threat, and grim recountings of off-screen encounters by various supporting characters, combined with Ken Hodges’ wonderful black and white cinematography and Lourie’s strong framing and direction, are cliched but resoundingly effective, especially considering the 1950’s were formative years for this particular genre of film, and the established grim nuclear-fear subtext throbs gently throughout the film. The film feels positively sinister. 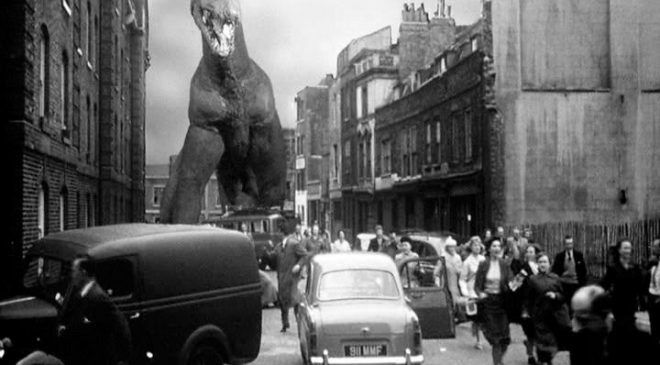 The editing (credited to Lee Doig) is tight and manipulates the audience into trying to peek around the film’s corners, and many a time I was scanning the edges of frame waiting for something to pop into view, and when the creature eventually makes landfall in the streets of London’s west end, the action kicks up several notches. Look, The Giant Behemoth isn’t the classic its bigger-budgeted brethren are, nor is it the memorable cult-favourite my review might seem to suggest it is (no, it really isn’t), but it’s a fun early salvo in the subgenre that is definitely worth the time to check out. Solid direction and above-average production value (although the creature effects do looks comparatively cheap) for the film’s overall aesthetic, and commendable if indifferent performances make the story instantly intriguing and the sense of expectation a lot stronger than I expected. I did find myself chuckling at the film occasionally with its dated effects and clunky compression of time and space between sequences, but The Giant Behemoth has more than enough quality behind the camera to reward committed genre fans and those with a curious eye.